Need help to improve tobacco cessation in your area? The Center for Tobacco Cessation (CTC) is the training and technical arm of the California Smokers’ Helpline. 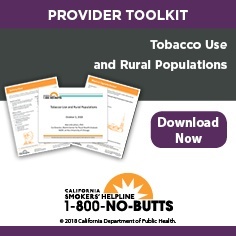 CTC helps organizations throughout California to increase their capacity in tobacco cessation. The Center offers free, live webinars several times each year on timely topics related to tobacco use and smoking cessation. Visit our Online Training page for a list of any upcoming webinars. Click here to sign up for notification by email of upcoming webinars. Other recorded webinars and online courses on a variety of cessation related topics may be found on our Online Training page. Download our fact sheets on a wide variety of tobacco-related topics for patients and providers. CTC staff can put together a training tailored to the particular needs of the health professionals in your organization. Click here to submit a request. For assistance, please contact Lesley C. Phillips at (858) 300-1051 or lcopeland@ucsd.edu.